Sandy Brown first learned to make ceramics in Japan in the 1960s and returned to the UK in the 1970s. She makes tableware and figurative sculptures in stoneware. The goddess figures are inspired by ancient clay figurines found in many cultures. This one stands 31cm high but some are almost life size. 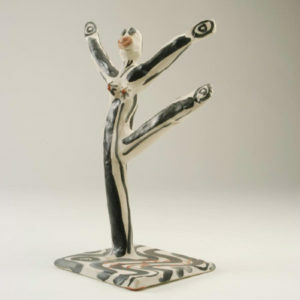 Goddess Figure 1990 – Sandy Brown, UKThey are built up in a very direct and simple way and decorated with bold black stripes. She sees these figures as an expression of her emotional state and each one is very personal. The prominent breasts and buttocks are emphasised with red colouring and the signature of ‘Sandy Brown’ forms part of the design.